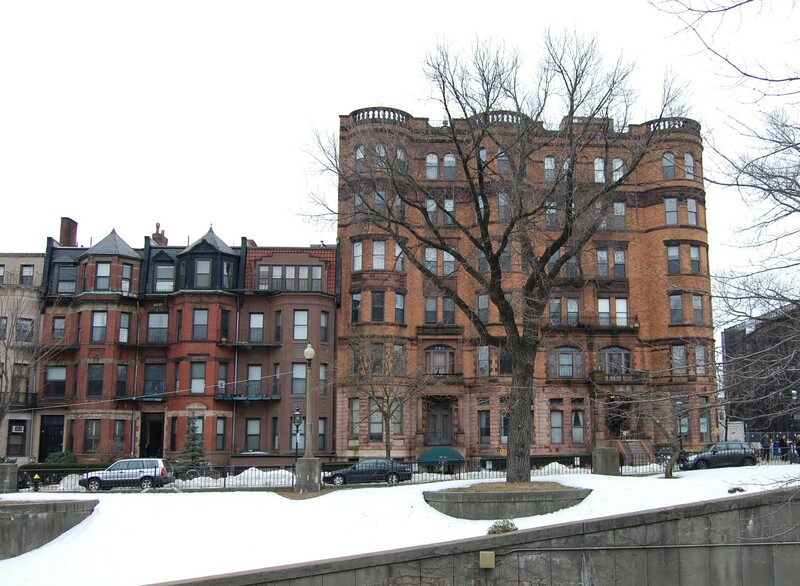 356 Commonwealth is located on the south side of Commonwealth, between Hereford and Massachusetts Avenue, with 354 Commonwealth to the east and 358 Commonwealth to the west. 356 Commonwealth was designed by Obed F. Smith, architect, and built in 1883-1884 by Vinal & Dodge, masons, for building contractor George Wheatland, Jr. for speculative sale. He is shown as the owner on the original building permit application, dated November 30, 1883. The house was originally numbered 354 Commonwealth until about 1889, when 328 Commonwealth was built and the houses to the west of it were renumbered. 356 Commonwealth was one of thirteen houses (336-360 Commonwealth) built for George Wheatland, Jr., by Warren D. Vinal and Charles A. Dodge on land owned by Charles Merriam and by Jacob Rogers. 336 Commonwealth was designed by George Avery, 338-340 Commonwealth were designed by Bradlee, Winslow, and Wetherell, and 342-360 Commonwealth were designed by Obed F. Smith. 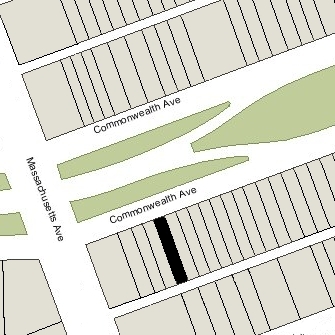 Click here for an index to the deeds for 356 Commonwealth, and click here for further information on the land on the south side of Commonwealth between Hereford and Massachusetts Avenue. On January 3, 1885, Jacob Rogers sold George Wheatland, Jr., the land where 356 Commonwealth was built. On July 7, 1885, 356 Commonwealth was purchased from George Wheatland, Jr., by Mary Williams Shattuck, the widow of Noah Gilman Shattuck, of Groton. During the 1885-1886 winter season, 356 Commonwealth was the home of Flavia (Smith) Smith, the widow of Kimball R. Smith. She previously had lived at 158 West Chester Park, where she operated a lodging house. Living with her at 356 Commonwealth were Joshua Granville Nickerson, an oil merchant, and his wife, Anna C. (Bassett) Nickerson. They previously had been lodgers with Mrs. Smith at 158 West Chester Park. Mrs. Smith and the Nickersons had moved from 356 Commonwealth by the next season. 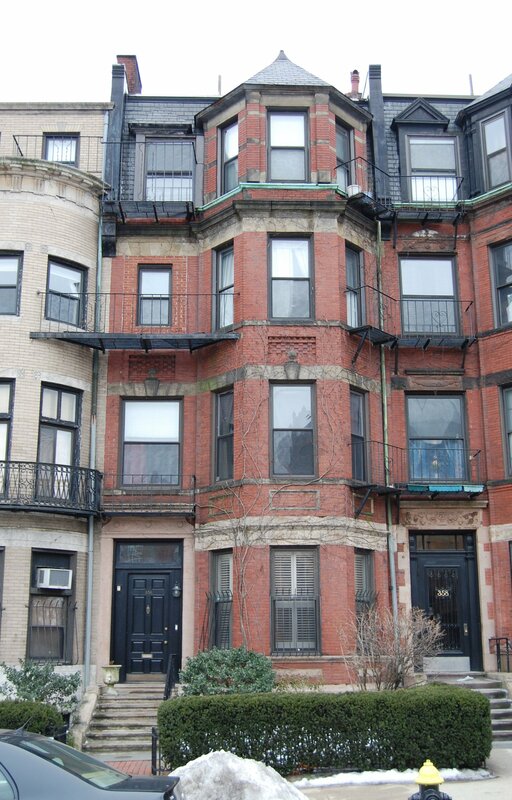 In 1887, the Nickersons were living at 282 Marlborough. During the 1886-1887 winter season, 356 Commonwealth was the home of Arthur D. McClellan, an attorney, and his wife, Mary A. (Townsend) McClellan. They previously had lived at the Hotel Copley at 18 Huntington. By the next season, they had moved next door to 358 Commonwealth. By the 1887-1888 winter season, it was the home of Mr. and Mrs. J. M. Fuller. They continued to live there during the next season, but moved thereafter. During the 1889-1890 winter season, Mary Shattuck made 356 Commonwealth her home. Her primary residence remained in Groton. During the 1890-1891 winter season, 356 Commonwealth was the home of Benjamin E. Corlew and his wife, Juliet (Snow) Corlew. They had lived at 395 Beacon during the previous season. Benjamin Corlew was a real estate dealer. By 1893, they had moved to Brookline. 356 Commonwealth was not listed in the 1892 Blue Book. On November 18, 1891, 356 Commonwealth was acquired from Mary Shattuck by real estate dealer Samuel Horatio Whitwell, and on November 21, 1891, it was acquired from him by attorney John Duncan Bryant. He and his wife, Ellen M. (Reynolds) Bryant, made it their home. They previously had lived at 28 St. James. They also maintained a home in Meriden, New Hampshire. Ellen Bryant died in July of 1908. 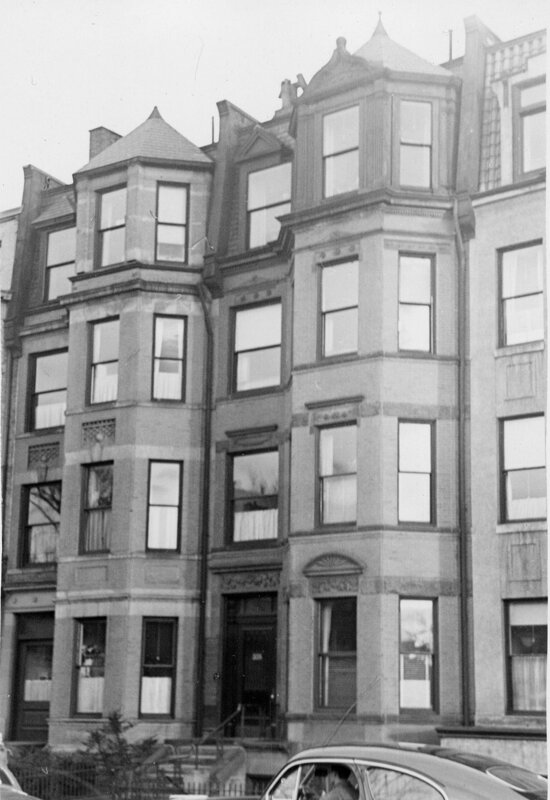 John Bryant continued to live at 356 Commonwealth until his death in July of 1911. By the 1911-1912 winter season, 356 Commonwealth was the home of Ellen Bryant’s nephew, Robert Duncan Reynolds, an engineer, and his wife, Fanny Louise (Lawrence) Reynolds. They previously had lived in Cambridge. He was the son of Ellen (Reynolds) Bryant’s brother and sister-in-law, Frank W. Reynolds and Cordelia Frances (Weld) Reynolds. On October 2, 1912, he purchased 356 Commonwealth from John Bryant’s estate. Robert and Fanny Reynolds had moved by 1913. By 1917, they were living in Cambridge. He continued to own 356 Commonwealth and lease it to others. 356 Commonwealth was not listed in the 1914-1916 Blue Books. By 1915, 356 Commonwealth was the home of Mrs. Lula M. (Fox) Darling, the former wife of Jerome Darling, who operated it a lodging house. She previously had lived at 81 Mt. Vernon. Lula Darling continued to live at 356 Commonwealth in January of 1920, at the time of the 1920 US Census, but had moved to 337 Commonwealth by the 1920-1921 winter season. On July 8, 1920, 356 Commonwealth was purchased from Robert D. Reynolds by Carolyn Draper (Nutt) Gilpatric, the wife of Dr. William Henry Gilpatric. He had acquired 358 Commonwealth in April of 1920 and had transferred it into her name in June of 1920. The Gilpatrics lived in Winchester. In June of 1920, Dr. Gilpatric filed for (and subsequently received) permission to convert 358 Commonwealth from an office and single-family dwelling into three dental offices and “habitation,” and in July of 1920, he filed for (and subsequently received) permission to convert 356 Commonwealth from offices and lodgings into dental offices. As part of the applications, he also received permission to cut doors in the party wall between the two buildings, on the first floor.